Lottery News: #PlayBackTheMoney! - Zuma’s $675 Million Gamble! 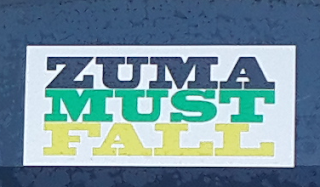 This morning while I was having a very nice black, green and yellow “#ZumaMustFall” sticker stuck to my car I overheard the news that the US Powerball Lottery Jackpot had reached a world record of $675 Million USD! Yes, that a big number and it gets even bigger when you translate it into African. #PayBackTheMoney - then Julius would have no choice but to go back to chanting: "Kill the Boer..." and twitter would lose a hash tag. You would even have enough left over to buy a further 43 Nkandla’s... keep 1000 milk bearing cows and produce 1 millionty liters of milk from them each day. But please remember to feed them. Why not buy 4 more jets #ZumaWivesMustFly (and twitter will gain a new hashtag). Anyway, this jackpot is truly remarkable, and I am sure you and your cronies have scheduling a conference call with your buddy Barack to find out what #BarackBackHander gets for allowing such a game to take place outside his kraal. So what do you think of my new hash tag? I know you have so many already, not all of them flattering, but I like to think this one has a ring to it: #PlayBackTheMoney. Not only is it simple, but it is fun too. You get to gamble on something other than the SA economy and if you win, you are paid a huge some of cash and no one had to be bribed! And if you lose, no one will lose their life savings. So everyone is happy! All you have to do is pick 5 lucky numbers from a pool of: 1 - 69, then 1 number from a pool of 1 - 26. If you guess them right, the money is yours to keep, easy! And the odds are in your favour, you have a one in Two hundred, twenty, thousand and thousand chance of winning. Thats nothing, right? So you are probably wondering how to pick your numbers? Now this is the easy part, take the date of birth of your wives, children, special anniversary dates, memorable moments and you are set. Of course you are free to take the above formula and work your own magic on it, maybe the date you got off your corruption charges or the time you took a shower? What ever you choose the final part is to buy your tickets.